Dungy On Vick: 'I Would Take A Chance On Him' It might be time to give fallen NFL star Michael Vick a second chance, says Tony Dungy, former coach of the Indianapolis Colts. Dungy has been giving Vick advice about his future since he paid a visit to the former quarterback in prison. 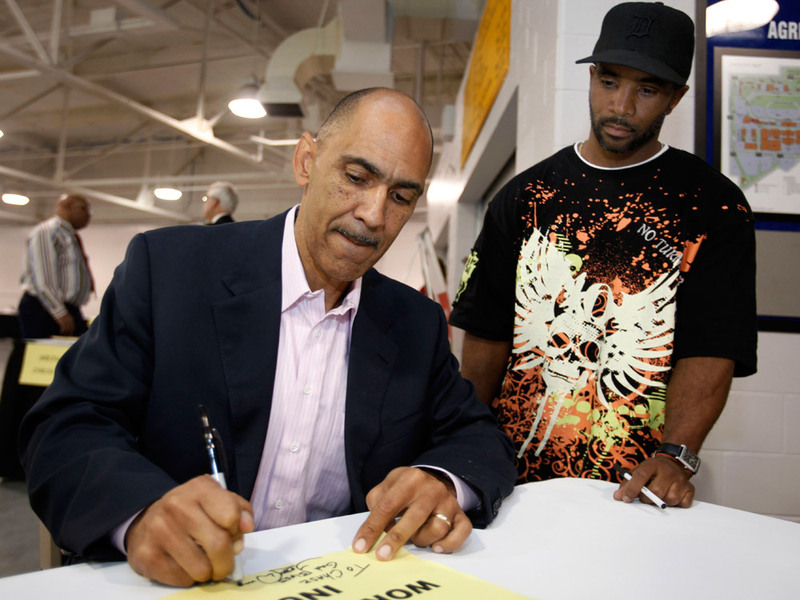 Former Indianapolis Colts coach Tony Dungy signs an autograph for Dwight Cobbs at a workshop for ex-offenders seeking jobs, in Indianapolis. It might be time to give fallen NFL star Michael Vick a second chance, says Tony Dungy, former coach of the Indianapolis Colts. Dungy has been giving Vick advice about his future since he paid a visit to the former quarterback in prison. As Dungy told NPR's Steve Inskeep, misbehavior is something that many coaches get used to. "I dealt with ....young men who did things that you and I would never do," Dungy says. The important distinction in this case, he says, is that Vick now realizes what he did was wrong. Now retired, Dungy works with high school students, and young men behind bars — advising them on making good decisions. He's also been talking with other NFL coaches about Vick's prospective comeback. The NFL reinstated Vick last month after he missed two seasons while serving a federal sentence for participating in an illegal dogfighting ring. Now Vick says he has learned his lesson, and he is hoping to find a new team. But Dungy, a former Super Bowl winner, knows that many NFL teams will have reservations about adding Vick to their rosters. "I would be hesitant, too," Dungy said, "because it's going to bring a major distraction to your organization and you are going to have some people who won't forgive. "So it's going to take a strong team who says, 'You know what, we believe in this; we believe in second chances. We're going to try to help this young man, and we may lose a few fans.' "
When asked if he would sign Michael Vick if were he still coaching, Tony Dungy recalled his own dealings with players who had off-field problems. "My idea was to always look them in the eye, and see if they've grown from it, see if I believed in them as a person," Dungy said. "After being around Mike for two or three months, I believe he would. I think he's learned from this. So if I were there, I would. I would take a chance on him."